The independent automatic capper, manufactured by CDA, allows the capping of beer bottles up to 1500 BPH. The B-Caps is compliant with all the size and shape of beer bottles. The capping strength is adjustable via a manometer, compliant with all crown caps. In addition, to a capsule detection cell. 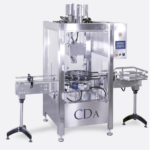 CDA’s B-Caps can be integrated to a complete packaging line. This automatic capper is the solution for all microbreweries, breweries and brewpubs who wants to increase their production.